HOTLINE MIAMI has become a rather lazy example to liken a game to in reviews, but in my defense, RUINER invites the comparison at every turn. 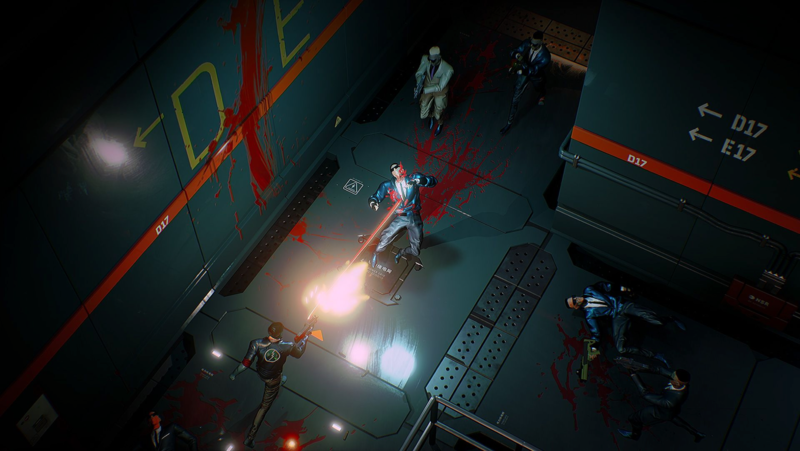 Published by Devolver Digital, the game is a fast-paced, top-down shooter featuring a mute, masked protagonist with a penchant for leather jackets and ultraviolence. To say RUINER lives in the shadow of Devolver’s poster boy is an understatement. But that is no reason to dismiss it; after all, it would be just as easy, and flippant, to say that HOTLINE MIAMI owes everything in its arsenal to DRIVE. It’s the crushing difficulty and cerebral shooting sprees of the game that set it apart from the crowd. Unlike HOTLINE, I can’t readily point out what makes RUINER stand out. You play as “Puppy,” a vigilante out to rescue his kidnapped brother from the evil Heaven Corp. Along the way, you’ll gun down hundreds of Heaven’s goons and a few of their lieutenants. That’s really all you need to know. There are “dialogue” choices, but they merely amount to either nodding to continue, or shrugging for more info. The plot merely exists to service the shootouts, which should sound quite familiar to anyone who played the first HOTLINE MIAMI, but RUINER at least has plenty of lore and an interesting world to go along with it. The hub of Rengkok City is charming and its denizens are fun to interact with, even if most arcs are left unresolved by the time the credits roll. It also helps that RUINER comes in a slick package. Both the visual design and soundtrack are absolutely impeccable. The cyberpunk setting doesn’t really “say” anything, but it sure as hell looks sick when I’m slicing dudes into ribbons with beam katanas and laser rifles. Messages flash across the screen alerting you of your kill count or incoming enemies a la SUPERHOT, but are holistically implemented so as to never create visual clutter. If nothing else, RUINER has style in spades. The substance is where things get dicey. From a gameplay perspective, RUINER remains unimpeachable. Your core functions of warp dashes, energy shields, and slow-mo allow for a wide range of tactical options. Similar to MASS EFFECT: ANDROMEDA, RUINER features a skill tree that can be re-specialized on the fly, allowing you to adopt a playstyle that fits the situation. But perhaps more importantly, RUINER just feels good. There’s a satisfying freeze frame effect each time you kill an enemy, giving you a brief moment to pause and reorient yourself in the wild fracases that punctuate each encounter. Even when you die, respawning at the previous checkpoint is a near instantaneous process, never creating a lull in the action. The staggering variety of weapons all handle like you’d want them to: shotguns blast bad guys into pink mist, lasers fry them into crisps, and clubs knock them off of ledges and send them careening in frantic spirals. That being said, while there’s plenty of things to shoot with, there aren’t a whole lot of things to shoot at. Enemies range from corporate mercenaries, gangsters, and killer androids, but they basically all boil down to “goon with gun.” Even the sub bosses fit into this limited classification, so even rare appearances by generic archetypes like “suicide bomber” and “zombie” feel fresh after mowing down waves of soldiers. And while there aren’t that many things to kill, there’s even fewer places to kill them in. You’ll travel to urban slums, gigantic factories, and secret laboratories, but their fondness for red emergency lights and steel catwalks makes each indistinguishable from the other. The fatigue of killing what might as well be the same people in the same locations begins to set in a little over halfway into RUINER’s roughly eight-hour campaign, and it only builds from there. The pacing of RUINER’s encounters also leaves a lot to be desired. There simply is no escalation of challenge. This isn’t a game that gets progressively harder, but rather one that arbitrarily decides when it wants to become difficult or not. Later chapters feel like child’s play compared to those in the middle, and the final encounters are such pushovers that they make the abrupt ending that follows even that more of a letdown. BEAM me out of here, Scotty! 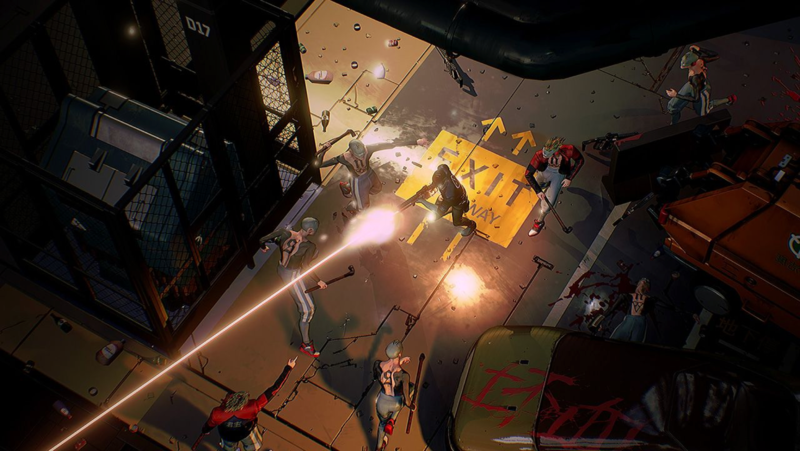 RUINER is loaded with everything it needs to be a killer app. Amazing visuals, sound design, and gunplay are all present and accounted for, but lack unity or direction. Throw in a tacked-on story and a sour note of a conclusion, and you’ve got one stinging disappointment. 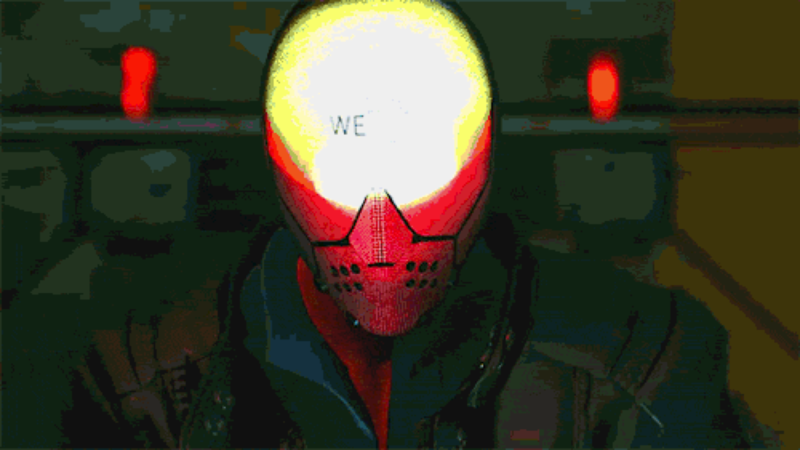 It’s a shame that RUINER fails to reach it’s incredible potential, but this is a game where it’s all in the name.